More in Rome — Christian Travel Study Programs, Inc. But a few tips can really help! Rome is chaos that only an Italian can truly understand. It is like “lasagna” - a layered experience that must be savored! At its peak, the word “Rome” meant civilization itself. Now it is the political capital of the Italian state, as well as the hub of the Catholic church (in the adjacent Vatican City) and what some authors lovingly call a “splendid junk pile” of layer of western civilization. In 2014 the census data said that 2.86 million people lived in the city (along with 5 million cats!). The city embraces some of the most elegant churches in the world, one of the most moving sculpted art collections in Europe (Borghese) and all the “savy shopping” associated with the “beautiful people” (Via del Corso). Many things are closed on Monday (read: most) and many places require reservations! The time in Rome is GMT +1. It is located about 12 miles inland from the west coast of Italy. The city is at its best when visited in April-May and October-November, August is DEAD, HOT and STICKY. I have tried to keep this information current, but addresses and phone numbers change all the time. Look up by name in a search engine some of these tips for more information! The city is overwhelming, but it is worth seeing. Seeing everything won’t help if you don’t take the time to understand it. I like to start off the day in a different little cafe each day, have a bite and watch people. I like to stop and read in a public park. I stroll in Italy in the early evening. This is the way to experience Rome! Tip Two: Watch Everything and everyone! Be especially careful on buses, metros and high tourist areas. Most confusion is staged to get your attention! Watch those that hold up cardboard signs, don’t give your wallet to so called “police checks”. Even mothers with babies are found picking pockets. If you lose a passport, we have to get a police report. Forget seeing your stuff again! Any reports should be filed at Polizia station at Termini. Passports are reported to US Embassy at Via Veneto 119 (Mon-Fri. 08:30-13:00;14:00-17:30). Emergency numbers are 113 (police) and 118 (ambulance). Tip Three: Know what there is to see! Pantheon (central area of medieval city) . Capitol Hill (central north of Forum). Borghese Gallery (north beyond walls). National Museum (in the Baths of Diocletian near Central Train station). Spanish Steps (north inside walls). Catacombs (southeast of the city along the Tiber River). Other sites of interest to Christians include: St. Paul’s Outside the Walls (tradition. burial site south of city near Tiber River); Baths of Caracalla (southeast inside walls) and Via Appia Antica (the road south where Paul came into the city in Acts). Tip Four: Don’t let first appearances fool you. When the city expanded to west of the Tiber (Trastevere), they used the Janiculum Hill as a western rampart. Tip Five: Identify some “central zones” to understand the city. 1. Ancient Rome: built around the Capitoline Hill, the Roman Forum captures the “feel” of this period. At its height, the ancient city had 1 million people! 2. Medieval Rome: a rogue band of 50,000 settled between the Vatican and the Pantheon. The tiny lanes have interesting little cafes and restaurants, etc. 3. Modern “fashion” Rome: Via del Corso is the hub of the “beautiful people” area, a triangle from Piazza del Popolo (North near the Tiber) and Piazza Venizia, over to the Spanish Steps – also called Trinita dei Monti). 4. Vatican City: an area of its own with St. Peter’s Basilica and Square; the Sistine Chapel and Vatican Museum. 5. Baroque Rome: Check out fountains and squares, it left its mark. Tip Six: Getting around Rome takes a bit of “know how”. 1. Information Offices: There are three main Tourist Information services in the city and another dozen kiosks marked “Informazioni Turistche”. The three main are at the airport, Termini (train station near track 3) and the nicest near the National Museum at Via Parigi (Piazza Repubblica). 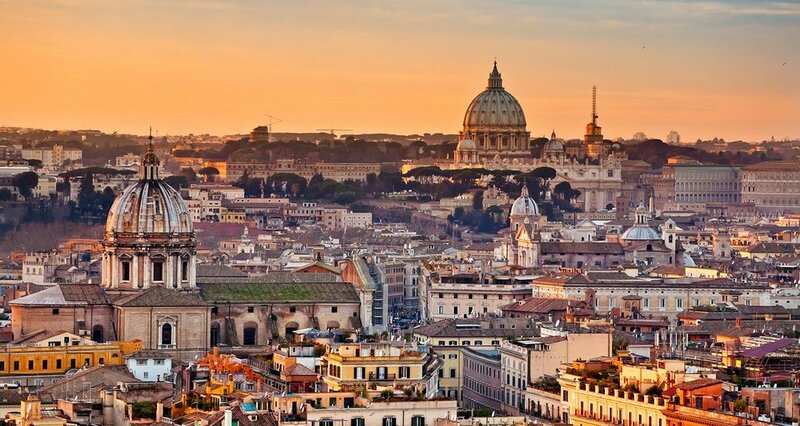 · Plane: Rome has two airports, the big one (Fiumicino- also called Lenonardo da Vinci, southwest of the city by the coast) and Ciampino (small). Trains from the airport (departing :07 and :37) to Stazione Termini leave hourly, take about 35 minutes to Termini. Return (:21 and :51) is usually from track 25 (or a nearby track). Some tickets need validation (read the ticket) at the yellow machine on the platform Tickets are available at machines and Biglietteria office. · Buses: Triburtina station (Metro B) is where most distance buses to other cities (Siena – 3 hrs, Assisi – 3 hrs.) are available. Termini station is the home of the ATAC city buses, a ticket is good for 75 minutes from validation. Both the buses and the Metros use the same tickets, available at newsstands or Metro stations (YOU CANNOT PURCHASE TICKETS ON BUSES). You “punch” the ticket in the orange machine on board the bus. (A substantial fine for not having it stamped by the orange machine!) Single tickets are less than inexpensive, and a full day pass isn’t a bad way to go either. #64 Termini: Piazza della Repubblica (National Museum), Piazza Venezia (near Forum ruins), Largo Argentina (near Pantheon), St. Peter’s Basilica. “J” Buses are larger, you can purchase a ticket on the bus ($1) and they have a “hostess”. 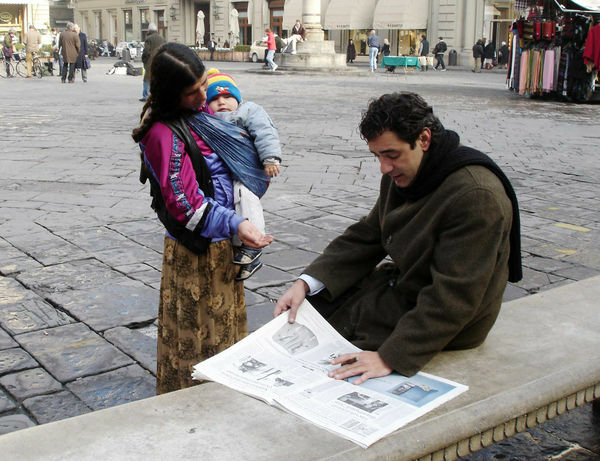 These are great for places like the Catacombs or St. Peter’s square (Porte Cavalegerri area due south of the square). · Metropolitana: On The Metro, one ticket is for one ride. Get a Metro map, and keep it with you! · Taxis: Go to the stands, don’t try hailing a cab unless you must! Ask where a taxi stand is: “Dov’e (DOH-vay) una fermata dei tassi?” (Come on, try it at least once!) Use metered cars that are marked taxi ONLY! Extra charges for Sunday, luggage or airport are allowed. Tip by 10%, you will be glad you did! Ride from the airport to the city center is about 45 minutes long and quite expensive. 4. Health and Safety: The most common injury is hit and run! Watch crossing the street - do like the locals. It takes guts to live in Rome! For a simple scratch, there are pharmacies marked with a Green cross all over Rome. For a doctor, call MEDline at 06-808-0995 and pay cash. The American Hospital is at 06-225-571. 5. Books: I have found some wonderful English books at the Termini central station inside the front door. There are a number of good book stores with English books included in the area around Piazza Republicca. 6. Need a tour apart from our group? The cheapest option for students ($20-25) is the introductory ATAC city bus (#110) tour with its 80 sites pointed out by an English speaking guide. Some people find is valuable, but I have found it slow and not very reliable. If you want to give it a try, this is available from the front of Termini, every half hour. Buy tickets at the kiosk marked “I bus” near platform C (March-Sept. 09:00-20:00). Scala Reale (Tom Rankin) has excellent in depth walking tours (06-474-5673) for small groups; see www.scalareale.org on the web. Through Eternity tours also has walking tours: St. Peter’s and Vatican (5.5 hrs, $28) and many others. See their website at: www.througheternity.com and pick one (06-700-9336). Walks of Rome has students offering tours like “Rome Through the Centuries”, see their website at: www.walksofitaly.com or call 06-484-853.